We survived a super blood blue moon eclipse, and have officially made it past January to the second month of the year. 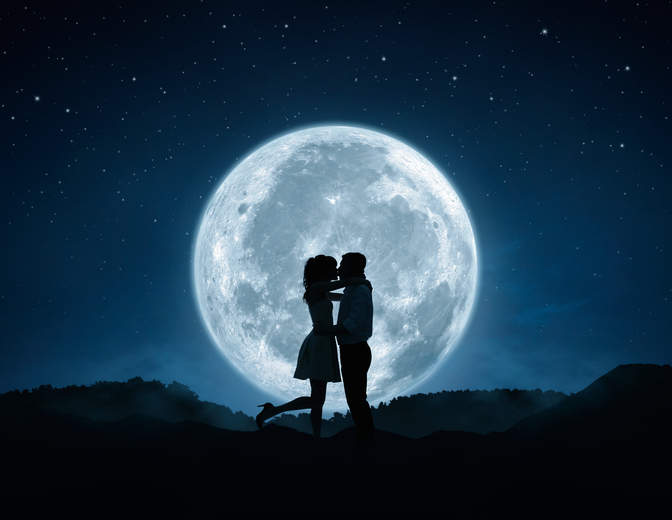 February is filled with many things: the slow, creeping return of spring, a new moon on February 15th, and of course, Valentine’s Day the day prior to that. So we have to wonder: will the Aquarius New Moon affect our Valentine’s Day? While we don’t totally dig the commercialization of love (it is still Aquarius season and that’s just the humanitarian in us talking), we do love love and we love to celebrate it in any form. "Aquarius isn't romantic, so don't expect your Valentine's Day to be either. The more you can stay calm and collected, no matter what's going on in your love life, the better off you'll be. This sign *does* love novelty and is always up to try something new, so don't despair — things will definitely be spicy! New moons represent a time of letting go of what’s no longer serving us, and for thinking about what we want to call in the next month during the moon’s cycles. So if you don’t have a sweetie this Valentine’s Day, not to fret. You can use the new moon solar eclipse on February 15th to get serious about the kind of partnership you want. Just remember, this is still Aquarius season, so expect the unexpected and definitely expect a little bit of spice. No matter how you spend your Valentine’s Day and Aquarius New Moon, we hope you do so amidst people you love.